Kyoto (京都市, Kyōto-shi, [kʲoːꜜto], [kʲoːtoꜜɕi]; , , or ) is a city located in the central part of the island of Honshu, Japan. It has a population close to 1.5 million. Formerly the Imperial capital of Japan for more than one thousand years, it is now the capital city of Kyoto Prefecture located in the Kansai region, as well as a major part of the Kyoto-Osaka-Kobe metropolitan area. Kyoto is also known as the thousand-year capital. In Japanese, the city has been called Kyō (京), Miyako (都), or Kyō no Miyako (京の都). In the 11th century, the city was renamed Kyoto ("capital city"), after the Chinese word for capital city, jingdu (京都). After the city of Edo was renamed Tokyo (東京, meaning "Eastern Capital") in 1868, and the seat of the Emperor was transferred there, Kyoto was known for a short time as Saikyō (西京, meaning "Western Capital"). Obsolete spellings for the city's name include Kioto, Miaco and Meaco. Another term commonly used to refer to the city in the pre-modern period was Keishi (京師), meaning "metropolis" or "capital". Although archaeological evidence suggests human settlement in Kyoto began as early as the Paleolithic period, relatively little is known about human activity in the area before the 6th century AD, around which time the Shimogamo Shrine is believed to have been established. During the 8th century, when powerful Buddhist clergy became involved in the affairs of the Imperial government, Emperor Kanmu chose to relocate the capital in order to distance it from the clerical establishment in Nara. His last choice for the site was the village of Uda, in the Kadono district of Yamashiro Province. The new city, Heian-kyō (平安京, "tranquility and peace capital"), a scaled replica of the then Tang capital Chang'an, became the seat of Japan's imperial court in 794, beginning the Heian period of Japanese history. Although military rulers established their governments either in Kyoto (Muromachi shogunate) or in other cities such as Kamakura (Kamakura shogunate) and Edo (Tokugawa shogunate), Kyoto remained Japan's capital until the transfer of the imperial court to Tokyo in 1869 at the time of the Imperial Restoration. The city suffered extensive destruction in the Ōnin War of 1467–1477, and did not really recover until the mid-16th century. Battles between samurai factions spilled into the streets, and came to involve the court nobility (kuge) and religious factions as well. Nobles' mansions were transformed into fortresses, deep trenches dug throughout the city for defense and as firebreaks, and numerous buildings burned. The city has not seen such widespread destruction since. In the late 16th century, Toyotomi Hideyoshi reconstructed the city by building new streets to double the number of north-south streets in central Kyoto, creating rectangle blocks superseding ancient square blocks. Hideyoshi also built earthwork walls called odoi (御土居) encircling the city. Teramachi Street in central Kyoto is a Buddhist temple quarter where Hideyoshi gathered temples in the city. Throughout the Edo period, the economy of the city flourished as one of three major cities in Japan, the others being Osaka and Edo. 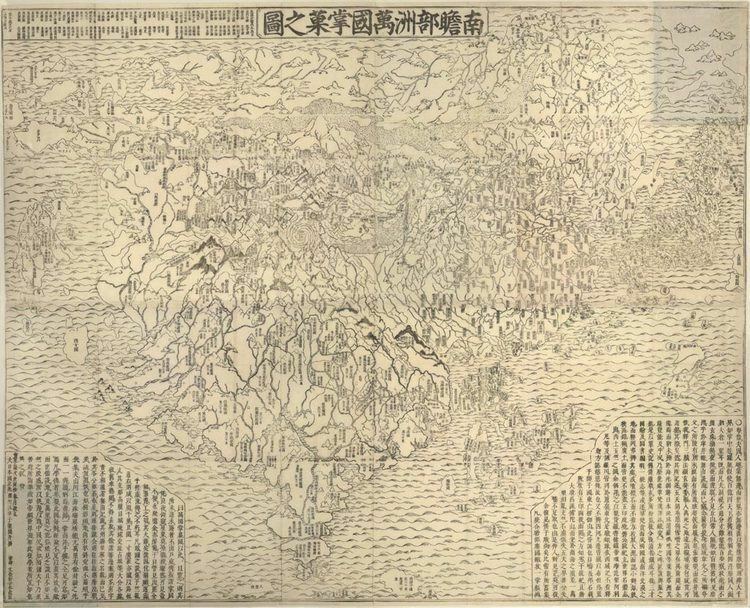 The Hamaguri rebellion of 1864 burnt down 28,000 houses in the city, and the subsequent move of the Emperor to Tokyo in 1869 weakened the economy. The modern city of Kyoto was formed on April 1, 1889. The construction of Lake Biwa Canal in 1890 was one measure taken to revive the city. The population of the city exceeded one million in 1932. There was some consideration by the United States of targeting Kyoto with an atomic bomb at the end of World War II because, as an intellectual center of Japan, it had a population "better able to appreciate the significance of the weapon" In the end, at the insistence of Henry L. Stimson, Secretary of War in the Roosevelt and Truman administrations, the city was removed from the list of targets and replaced by Nagasaki. The city was largely spared from conventional bombing as well, although small-scale air raids did result in casualties. As a result, the Imperial City (Emeritus) of Kyoto is one of the few Japanese cities that still have an abundance of prewar buildings, such as the traditional townhouses known as machiya. However, modernization is continually breaking down the traditional Kyoto in favor of newer architecture, such as the Kyōto Station complex. Kyoto became a city designated by government ordinance on September 1, 1956. In 1997, Kyoto hosted the conference that resulted in the protocol on greenhouse gas emissions that bears the city's name. Kyoto is located in a valley, part of the Yamashiro (or Kyoto) Basin, in the eastern part of the mountainous region known as the Tamba highlands. The Yamashiro Basin is surrounded on three sides by mountains known as Higashiyama, Kitayama and Nishiyama, with a height just above 1,000 metres (3,281 ft) above sea level. This interior positioning results in hot summers and cold winters. There are three rivers in the basin, the Ujigawa to the south, the Katsuragawa to the west, and the Kamogawa to the east. Kyoto City takes up 17.9% of the land in the prefecture with an area of 827.9 square kilometres (319.7 sq mi). The original city was arranged in accordance with traditional Chinese feng shui following the model of the ancient Chinese capital of Chang'an (present-day Xi'an). The Imperial Palace faced south, resulting in Ukyō (the right sector of the capital) being on the west while Sakyō (the left sector) is on the east. The streets in the modern-day wards of Nakagyō, Shimogyō, and Kamigyō-ku still follow a grid pattern. Today, the main business district is located to the south of the old Imperial Palace, with the less-populated northern area retaining a far greener feel. Surrounding areas do not follow the same grid pattern as the center of the city, though streets throughout Kyoto share the distinction of having names. Kyoto sits atop a large natural water table that provides the city with ample freshwater wells. Due to large-scale urbanization, the amount of rain draining into the table is dwindling and wells across the area are drying at an increasing rate. Historically, Kyoto was the largest city in Japan, later surpassed by Osaka and Edo (Tokyo) towards the end of the 16th century. In the pre-war years, Kyoto traded places with Kobe and Nagoya ranking as the 4th and 5th largest city. In 1947, it went back to being 3rd. By 1960 it had fallen to 5th again, and by 1990 it had fallen to 7th, in 2015 it is now 9th. Kyoto has a humid subtropical climate (Köppen Cfa), featuring a marked seasonal variation in temperature and precipitation. Summers are hot and humid, but winters are relatively cold with occasional snowfall. Kyoto's rain season begins around the middle of June and lasts until the end of July, yielding to a hot and sunny latter half of the summer. Kyoto, along with most of the Pacific coast and central areas of Japan is prone to typhoons during September and October. The directly elected executive mayor in Kyoto as of 2013 is Daisaku Kadokawa, an independent supported by Democratic Party of Japan, Liberal Democratic Party, New Komeito Party, Your Party and Social Democratic Party. The legislative city assembly has 69 elected members. Kyoto has eleven wards (区, ku). Together, they make up the city of Kyoto. Like other cities in Japan, Kyoto has a single mayor and a city council. Although ravaged by wars, fires, and earthquakes during its eleven centuries as the imperial capital, Kyoto was spared from much of the destruction of World War II. It was removed from the atomic bomb target list (which it had headed) by the personal intervention of Secretary of War Henry L. Stimson, as Stimson wanted to save this cultural center, which he knew from his honeymoon and later diplomatic visits. With its 2,000 religious places – 1,600 Buddhist temples and 400 Shinto shrines, as well as palaces, gardens and architecture intact – it is one of the best preserved cities in Japan. Among the most famous temples in Japan are Kiyomizu-dera, a magnificent wooden temple supported by pillars off the slope of a mountain; Kinkaku-ji, the Temple of the Golden Pavilion; Ginkaku-ji, the Temple of the Silver Pavilion; and Ryōan-ji, famous for its rock garden. The Heian Jingū is a Shinto shrine, built in 1895, celebrating the Imperial family and commemorating the first and last emperors to reside in Kyoto. Three special sites have connections to the imperial family: the Kyoto Gyoen area including the Kyoto Imperial Palace and Sentō Imperial Palace, homes of the Emperors of Japan for many centuries; Katsura Imperial Villa, one of the nation's finest architectural treasures; and Shugaku-in Imperial Villa, one of its best Japanese gardens. In addition, the temple of Sennyu-ji houses the tombs of the emperors from Shijō to Kōmei. Other sites in Kyoto include Arashiyama, the Gion and Pontochō geisha quarters, the Philosopher's Walk, and the canals that line some of the older streets. The "Historic Monuments of Ancient Kyoto" are listed by the UNESCO as a World Heritage Site. These include the Kamo Shrines (Kami and Shimo), Kyō-ō-Gokokuji (Tō-ji), Kiyomizu-dera, Daigo-ji, Ninna-ji, Saihō-ji (Kokedera), Tenryū-ji, Rokuon-ji (Kinkaku-ji), Jishō-ji (Ginkaku-ji), Ryōan-ji, Hongan-ji, Kōzan-ji and the Nijō Castle, primarily built by the Tokugawa shoguns. Other sites outside the city are also on the list. Kyoto is renowned for its abundance of delicious Japanese foods and cuisine. The special circumstances of Kyoto as a city away from the sea and home to many Buddhist temples resulted in the development of a variety of vegetables peculiar to the Kyoto area (京野菜, kyō-yasai). Japan's television and film industry has its center in Kyoto. Many jidaigeki, action films featuring samurai, were shot at Toei Uzumasa Eigamura. A film set and theme park in one, Eigamura features replicas of traditional Japanese buildings, which are used for jidaigeki. Among the sets are a replica of the old Nihonbashi (the bridge at the entry to Edo), a traditional courthouse, a Meiji Period police box and part of the former Yoshiwara red-light district. Actual film shooting takes place occasionally, and visitors are welcome to observe the action. The dialect spoken in Kyoto is known as Kyō-kotoba or Kyōto-ben, a constituent dialect of the Kansai dialect. When Kyoto was the capital of Japan, the Kyoto dialect was the de facto standard Japanese and influenced the development of Tokyo dialect, the modern standard Japanese. Famous Kyoto expressions are a polite copula dosu, an honorific verb ending -haru, a greeting phrase okoshi-yasu "welcome", etc. The key industry of Kyoto is information technology and electronics: the city is home to the headquarters of Nintendo, Intelligent Systems, Dainippon Screen, Tose, Omron, Kyocera, Shimadzu Corp., Rohm, Horiba, Nidec Corporation, Nichicon, Nissin Electric, and GS Yuasa. Tourism also forms a large base of Kyoto's economy. The city's cultural heritages are constantly visited by school groups from across Japan, and many foreign tourists also stop in Kyoto. In 2014, the city government announced that a record number of tourists had visited Kyoto, and it was chosen as the world's best city by U.S. travel magazine. Traditional Japanese crafts are also major industry of Kyoto, most of which are run by artisans in small plants. Kyoto's kimono weavers are particularly renowned, and the city remains the premier center of kimono manufacturing. Such businesses, vibrant in past centuries, have declined in recent years as sales of traditional goods stagnate. Sake brewing is Kyoto's traditional industry. Gekkeikan and Takara Holdings are major sake brewers headquartered in Kyoto. Other notable businesses headquartered in Kyoto includes Aiful, Ishida, MK, Nissen Holdings, Oh-sho, Sagawa Express, Volks and Wacoal. The concentration of population to the capital city area is 55%, which is highest among the prefectures. The economic difference between the coastal area and inland area including Kyoto basin is significant. Greater Kyoto, Kyoto Metropolitan Employment Area, (2.7 million people) had a total GDP of US$115.3 million in 2010. Home to 37 institutions of higher education, Kyoto is one of the academic centers in Japan.Kyoto University is considered to be one of the top national universities nationwide. According to The Times Higher Education Supplement top-ranking university, Kyoto University is ranked the second university in Japan after University of Tokyo, and 25th overall in the world as of 2010. The Kyoto Institute of Technology is also among the most famous universities in Japan and is considered to be one of the best universities for architecture and design in the country. Popular private universities, such as Doshisha University and Ritsumeikan University are also located in the city. Kyoto also has a unique higher education network called the Consortium of Universities in Kyoto, which consists of three national, three public (prefectural and municipal), and 45 private universities, as well as the city and five other organizations. The combination does not offer a degree, but offers the courses as part of a degree at participating universities. In addition to Japanese universities and colleges, selected American universities also operates in the city for education and research. Kyoto Consortium for Japanese Studies (KCJS) is a combination of 14 American universities that sponsors a two-semester academic program for undergraduates who wish to do advanced work in Japanese language and cultural studies. The American university, Stanford University, operates a "Japan Center" in Kyoto. Although Kyoto does not have its own airport, travelers can get to the city via Kansai International Airport and Osaka International Airport in Osaka Prefecture. The Haruka Express operated by JR West carries passengers from Kansai Airport to Kyoto Station in 73 minutes. Osaka Airport Transport buses connect Itami Airport and Kyoto Station Hachijo Gate in 50 minutes and cost 1,280 yen for a one-way trip. Some buses go further, make stops at major hotels and terminals in downtown area. Kyoto's municipal bus network is extensive. Private carriers also operate within the city. Many tourists join commuters on the public buses, or take tour buses. Kyoto's buses have announcements in English and electronic signs with stops written in the Latin alphabet. Most city buses have a fixed fare. A one-day bus pass and a combined unlimited train and bus pass are also available. These are especially useful for visiting many different points of interest within Kyoto. The bus information center just outside the central station handles tickets and passes. The municipal transport company publishes a very useful leaflet called "Bus Navi." It contains a route map for the bus lines to most sights and fare information. This too is available at the information center in front of the main station. Buses operating on routes within the city, the region, and the nation stop at Kyoto Station. In addition to Kyoto Station, bus transfer is available at the intersections of Shijō Kawaramachi and Sanjō Keihan. The intersection of Karasuma Kitaōji to the north of downtown has a major bus terminal serving passengers who take the Karasuma Line running beneath Karasuma Street, Kyoto's main north–south street. Cycling is a very important form of personal transportation in the city. The geography and scale of the city are such that the city may be easily navigated on a bicycle. Bicycle theft is not common, but finding permitted bicycle parking areas can be difficult. Bicycles parked in non-permitted areas are impounded. The city is connected with other parts of Japan by the Meishin Expressway, which has two interchanges in the city: Kyoto Higashi (Kyoto East) in Yamashina-ku and Kyoto Minami (Kyoto South) in Fushimi-ku. The Kyoto-Jukan Expressway connects the city to northern regions of Kyoto Prefecture. The Daini Keihan Road is a new bypass (completed in 2010) to Osaka. Although Kyoto has fewer toll-highways than other comparable Japanese cities, it is served with dual and even triple-carriageway national roads. As of 2010, only 8.2 kilometres (5.1 miles) of the Hanshin Expressway Kyoto Route is in operation. There are nine national highways in the city of Kyoto: Route 1, Route 8, Route 9, Route 24, Route 162, Route 171, Route 367, Route 477 and Route 478. Just like other major cities in Japan, Kyoto is well served by rail transportation systems operated by several different companies and organizations. The city's main gateway terminal, Kyoto Station, which is one of the most popular stations in the country, connects The Tōkaidō Shinkansen bullet train Line (see below) with five JR West lines, a Kintetsu line and a municipal subway line. The Keihan, the Hankyu, and other rail networks also offer frequent services within the city and to other cities and suburbs in the Kinki region. The Kyoto Municipal Transportation Bureau operates the Kyoto Municipal Subway consisting of two lines: the Karasuma Line and the Tōzai Line. The Karasuma Line is coloured green, and its stations are given numbers following the letter "K". The line has following stations, from north to south: Kokusaikaikan (terminal) and Matsugasaki in Sakyō-ku; Kitayama and Kitaōji in Kita-ku; Kuramaguchi and Imadegawa in Kamigyō-ku; Marutamachi and Karasuma Oike in Nakagyō-ku; Shijō, Gojō and Kyōto in Shimogyō-ku; Kujō and Jūjō in Minami-ku; and Kuinabashi and Takeda (terminal) in Fushimi-ku. Between Kitaōji and Jūjō, trains run beneath the north-south Karasuma Street (烏丸通, Karasuma-dori), hence the name. They link to the other subway line, the Tōzai Line, at Karasuma Oike. They also connect to the JR lines at Kyoto Station and the Hankyu Kyoto Line running cross-town beneath Shijō Street at the intersection of Shijō Karasuma, Kyoto's central business district. At Shijō Karasuma, the subway station is named Shijō, whereas Hankyu's station is called Karasuma. The Transportation Bureau and Kintetsu jointly operate through services, which continue to the Kintetsu Kyoto Line to Kintetsu Nara Station in Nara. The Karasuma Line and the Kintetsu Kyoto Line connect at Kyoto and Takeda. All the stations are located in the city proper. The Tōzai Line is coloured vermilion, and its stations are given numbers following the letter "T". This line runs from the southeastern area of the city, then east to west (i.e. tōzai in Japanese) through the Kyoto downtown area where trains run beneath the three east-west streets: Sanjō Street (三条通, Sanjō-dori), Oike Street (御池通, Oike-dori) and Oshikōji Street (押小路通, Oshikōji-dori). The line has following stations, from east to west: Rokujizō (terminal) in Uji; Ishida and Daigo in Fushimi-ku; Ono, Nagitsuji, Higashino, Yamashina and Misasagi in Yamashina-ku; Keage, Higashiyama and Sanjō Keihan in Higashiyama-ku; Kyoto Shiyakusho-mae, Karasuma Oike, Nijōjō-mae, Nijō and Nishiōji Oike in Nakagyō-ku; and Uzumasa Tenjingawa (terminal) in Ukyō-ku. The Keihan Keishin Line has been integrated into this line, and thus Keihan provides through services from Hamaōtsu in the neighbouring city of Ōtsu, the capital of Shiga Prefecture. The Tōzai Line connects to the Keihan lines at Rokujizō, Yamashina, Misasagi and Sanjō Keihan, to the JR lines at Nijō, Yamashina and Rokujizō, and to the Keifuku Electric Railroad at Uzumasa Tenjingawa. All the stations except Rokujizō are located in Kyoto. The Tōkaidō Shinkansen operated by JR Central provides high-speed rail service linking Kyoto with Nagoya, Yokohama and Tokyo to the east of Kyoto and with nearby Osaka and points west on the San'yō Shinkansen, such as Kobe, Okayama, Hiroshima, Kitakyushu, and Fukuoka. The trip from Tokyo takes about two hours and twenty-two minutes. 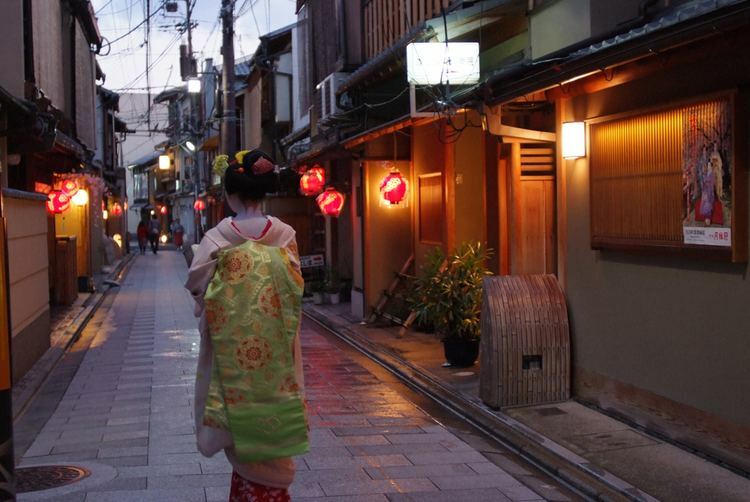 From Hakata in Fukuoka, Nozomi takes you to Kyoto in just over three hours. All trains including Nozomi stop at Kyoto Station, serving as a gateway to not only Kyoto Prefecture but also northeast Osaka, south Shiga and north Nara. There are a number of rivers, canals and other navigable waterways in Kyoto. The Seta and Uji rivers (Yodo River), Kamogawa and Katsura river flow through Kyoto. Lake Biwa Canal was a significant infrastructural development. In present days, however, the waterways are not used for passenger or goods transportation except for limited sightseeing purpose such as Hozugawa Kudari boat on the Hozu River and Jukkoku bune sightseeing tour boat in Fushimi-ku area. Kyoto contains roughly 2,000 temples and shrines. About 20% of Japan's National Treasures and 14% of Important Cultural Properties exist in the city proper. The UNESCO World Heritage Site Historic Monuments of Ancient Kyoto (Kyoto, Uji and Otsu Cities) includes 17 locations in Kyoto, Uji in Kyoto Prefecture, and Ōtsu in Shiga Prefecture. The site was designated as World Heritage in 1994. Kyoto is well known for its traditional festivals which have been held for over 1000 years and are a major tourist attraction. The first is the Aoi Matsuri on May 15. Two months later (July 1 to 31) is the Gion Matsuri known as one of the 3 great festivals of Japan, culminating in a massive parade on July 17. Kyoto marks the Bon Festival with the Gozan no Okuribi, lighting fires on mountains to guide the spirits home (August 16). 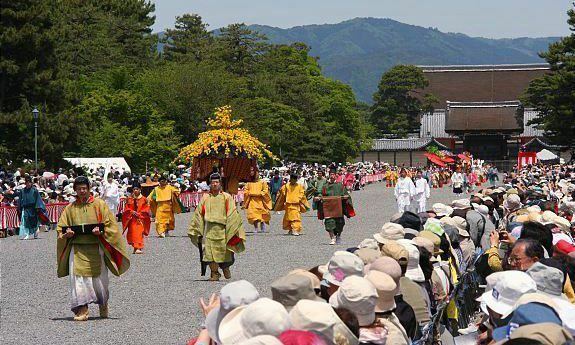 The October 22 Jidai Matsuri, Festival of the Ages, celebrates Kyoto's illustrious past. In football, Kyoto is represented by Kyoto Sanga F.C. who won the Emperor's Cup in 2002, and rose to J. League's Division 1 in 2005. Kyoto Sanga has a long history as an amateur non-company club, although it was only with the advent of professionalization that it was able to compete in the Japanese top division. Amateur football clubs such as F.C. Kyoto BAMB 1993 and Kyoto Shiko Club (both breakaway factions of the original Kyoto Shiko club that became Kyoto Sanga) as well as unrelated AS Laranja Kyoto compete in the regional Kansai soccer league. Between 1951 and 1952 the Central League team Shochiku Robins played their franchised games at Kinugasa Ballpark (ja:衣笠球場, Kinugasa Kyujo) in Kita-ku. In 2010, Nishikyogoku Stadium in Ukyo-ku became the home of a newly formed girls professional baseball team, the Kyoto Asto Dreams. Additionally, Kyoto's high school baseball teams are strong, with Heian and Toba in particular making strong showings recently at the annual tournament held in Koshien Stadium, Nishinomiya, near Osaka. Kyoto Racecourse in Fushimi-ku is one of ten racecourses operated by the Japan Racing Association. It hosts notable horse races including the Kikuka-shō, Spring Tenno Sho, and Queen Elizabeth II Commemorative Cup. 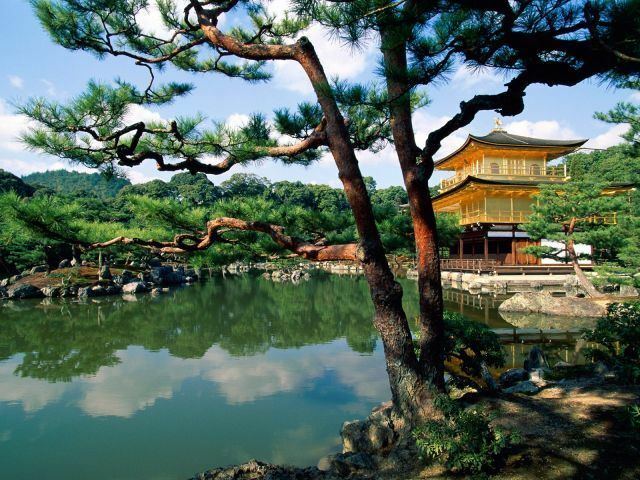 Kyoto, having been the capital city of Japan, a seat of learning and culture, has long-established ties with other great cities around the world. Many foreign scholars, artists and writers have stayed in Kyoto over the centuries.